Welcome back to Terminal City Roller Derby 2019! To celebrate our new name and the new year, we’re having a party! 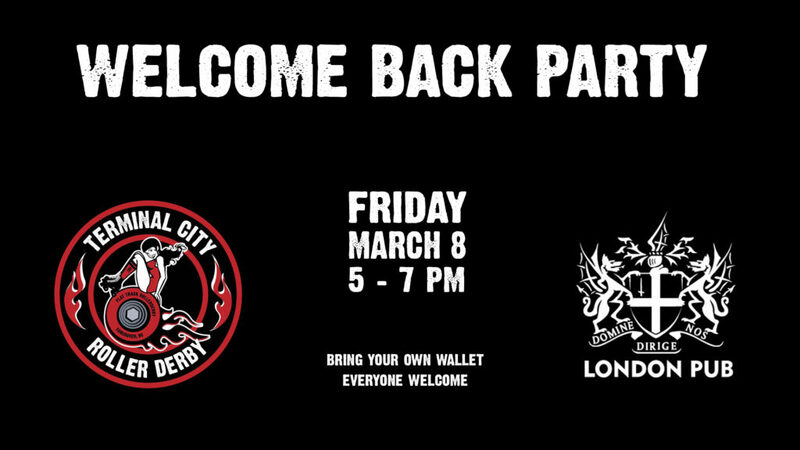 Join us at the London Pub on Friday, March 8 from 5-7 pm for food, drinks and fun! This is a BYOW (bring your own wallet) event with some happy hour specials for us to enjoy. Skaters, fans, family, general public – everyone is welcome! Have you been thinking about roller derby as a fun activity? Are you trying to convince your friend to join up with you? Come! Bring your friend! We would love to meet you and talk about roller derby together. Just want to hang out with some really cool people? Come on out! It’s gonna be a blast!